Veggies - Love Em or Hate Em? In my house, we love veggies. Whether it is steamed, in a curry, stir fried or straight up in a salad, we love it all. We are trying to include more veggies in diet as much as we can, because it is healthier for you. And when you eat what's in season, it tends to be a lot easier on the pocket too. I try to eat local produce as much as I can and always go for what's in season. 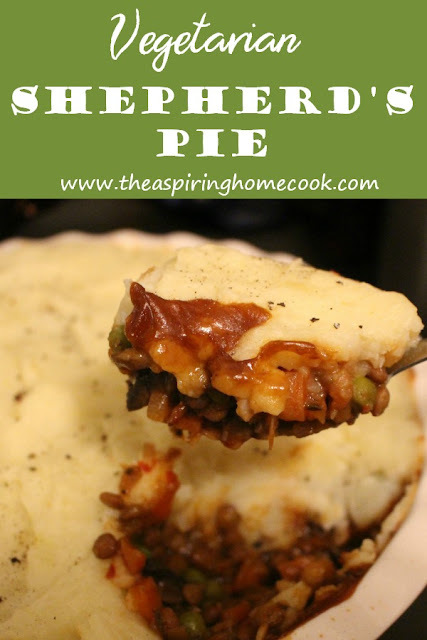 When I came across a recipe for a vegetarian Shepherd's Pie, I knew I had to try it. It calls for a bunch of veggies, which most of us usually have on hand, and lentils. We eat a lot of lentils, pulses, legumes, so I knew this would be an interesting way to switch things up. There are a few processes involved in the recipe, but they are all really simple and I loved that there were leftovers. 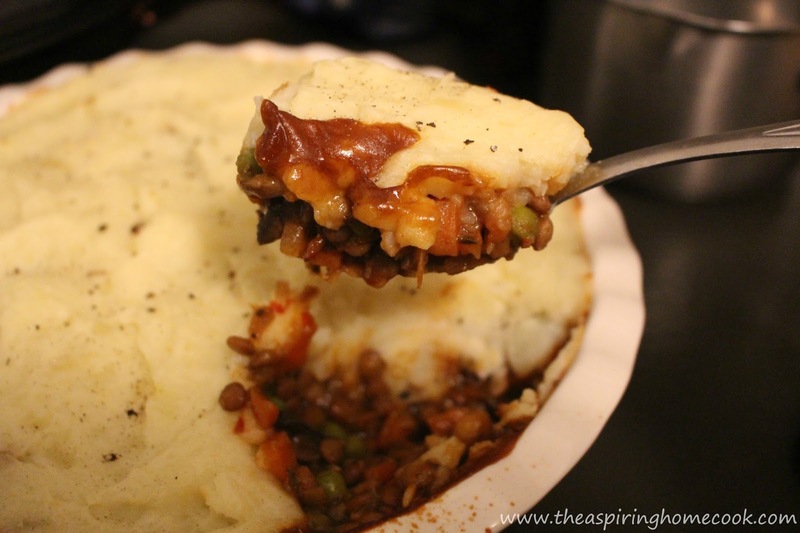 This Veggie Shepherd's Pie is chock full of veggies and lentils and is the perfect meal for a cold, wet day. The veggies and lentils are full of flavor and are topped with mashed potatoes.And who doesn't love mashed potatoes? Add the onions and garlic and saute till the onions have softened. While the onions are cooking, dice the carrots and celery to 'more or less' resemble the size of the peas and lentils. Once the onions have softened, add the diced carrots and celery to the pan and cook till the celery has started to soften. Now add the sliced mushrooms, salt, thyme, smoked paprika and pepper to the pan. Stir well to let the spices incorporate. Continue cooking till the mushrooms have fully softened. Add the tomato paste and the flour to the pot. Stir and continue to cook the veggies till they're coated and the pasty mix starts to coat the bottom of the pan. This should take about 2 minutes. Add the vegetable broth to the pan. Stir to dissolve the flour and tomato paste that has coated the bottom of the pan. Bring the broth to a simmer. It will have started thickening. Add in the cooked lentils and peas and let them all heat through. Taste for seasoning and add more salt and pepper if needed, stir through and take the pot of the heat. Wash and peel the potatoes and cut them into cubes to cut down on cooking time. Boil them in salted water till tender. Drain and mash the potatoes with the butter (if you are using) till no lumps are left. Taste and add more salt, if needed. Add the vegetables to a large casserole dish (I used my 9 inch ceramic pie dish). Top with the mashed potatoes. It is easier to handle the mashed potato when it is still warm. I used the back of a spoon to flatten the mashed potatoes. You can choose to use a fork or a spoon to create a decorative pattern if you'd like. Bake for around 15 minutes till everything has heated through. If you want the mashed potatoes to brown some more, place it closer to the top heating element of your oven, or turn your broiler on (if your oven has that function) and bake for a few more minutes. Watch closely and when it has browned to your liking, take it out of the oven. Sprinkle some more freshly cracked black pepper over the top and serve hot.